Condition: Oil on canvas, relined, cracquelure, restorations, good impasto, in a grand gilded composite frame with artist’s name inscribed to lower edge, some retouches and chips, abrasions, flakes but overall in good order and very decorative. This work is unsigned but exhibits enough characteristics of Wilson’s work to attribute it to the artist, with the attribution on the early frame adding to speculation. Richard Wilson was a pioneer of British landscape painting in the 18th Century and was one of the Founding members of the Royal Academy. He painted in Italy and Britain and was tutored by Francesco Zuccharelli. 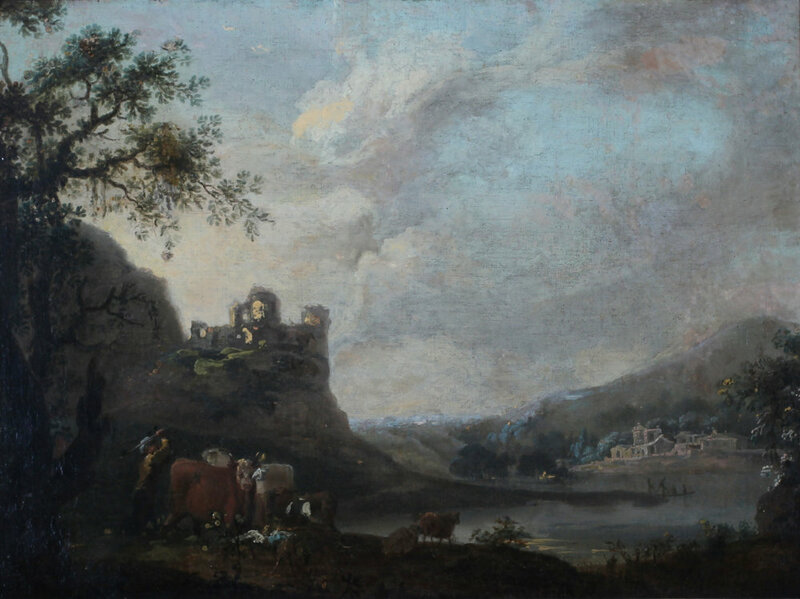 He was heavily influenced by the like of Claude Lorraine, shown in the atmospheric moods and fluid brushstrokes which are exhibited in the example here. Sadly it remains unsigned so we cannot apply a full attribution.